Frequently, members of the Apostolate raise questions to me about the ongoing spiritual practices of Marian Catechists. Recently, the questions have centered a good deal around the discipline of the Sacred Liturgy set forth in the Institutio Generalis Missalis Romani or General Instruction of the Roman Missal, sometimes popularly referred by the acronym, GIRM. One of the most frequent questions pertains to the posture and gestures to be employed in receiving Holy Communion. I know that Father Hardon insisted very much that Marian Catechists should always kneel in receiving Holy Communion. Recognizing our unworthiness to approach the Lord in the Most Blessed Sacrament, there can be no question that kneeling is the most appropriate posture for the reception of Holy Communion. 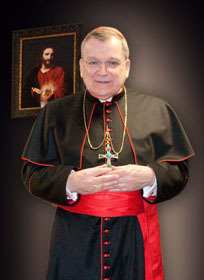 The Bishops of the United States, in view of fostering unity among the faithful in the most sacred action of receiving the true Body and Blood of Christ and having concern for large congregations coming forward in procession to receive Holy Communion, have established standing as the posture for receiving Holy Communion in our nation. “The norm for the reception of Holy Communion in the dioceses of the United States is standing. Communicants should not be denied Holy Communion because they kneel. Rather, such instances should be addressed pastorally, by providing the faithful with proper catechesis on the reasons for this norm” (General Instruction of the Roman Missal, n. 160b). Even though Father Hardon rightly preferred Marian Catechists to receive Holy Communion kneeling, he also submitted himself humbly to legitimate Church authority and expected the same of Marian Catechists. Therefore, I know that he would want us to be examples of Christ-like obedience, especially at the most sacred moment of the reception of Holy Communion. The Bishops of the United States give further instruction regarding the posture for receiving Holy Communion, which it is important for us to know. One does not just stand before receiving the Sacred Host or the Precious Blood. The Bishops give the following instruction: “When receiving Holy Communion, the communicant bows his or her head before the Sacrament as a gesture of reverence and receives the Body of the Lord from the minister…. When Holy Communion is received under both kinds, the sign of reverence is also made before receiving the Precious Blood” (Ibid., n. 160c). I hope that the above clarifies the question regarding the correct posture for receiving Holy Communion. In any case, we should all be very respectful of the postures which are used to express faith in the Real Presence. What is most important is the interior disposition of the communicant, which will be transparent to others of faith, no matter what reverent gesture is employed. To those who are disappointed with the norm of standing to receive Holy Communion in the United States, I offer the following spiritual counsel: As you approach to receive our Lord in Holy Communion, genuflect before Him in your heart. Let your reverent bow before receiving Holy Communion reflect your internal genuflection, in total adoration, before the Real Presence.